Named for the Greek Goddess of the Hunt, Artemis is a three-masted barque launched as a whaler in Norway in 1926. Converted in the late forties, she sailed as a freighter until the late nineties. Refitted in 2001, she now carries up to 120 passengers within her overall length of 193 feet and under 11,302 square feet of canvas. 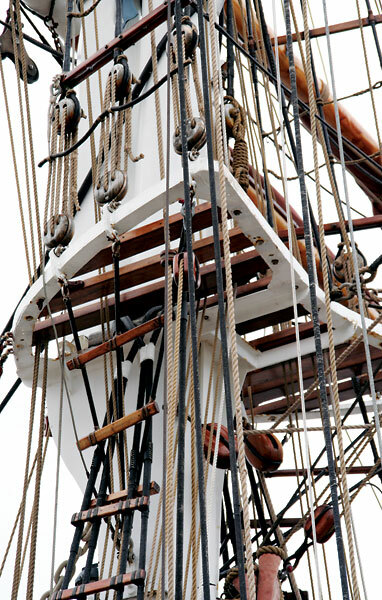 With normal vision, the rigging complexity of a single tall ship is impressive but the combination of several viewed through a long lens is almost incomprehensible. 1926: launched as the Padua in Bremerhaven. 1938-39: set an unbroken round-trip sailing record of 8 months 23 days trip from Hamburg to Australia via Chile. 1946: ceded to the USSR. 1968-72: major refit. Now part of the Baltic Academy in Kalingrad. Named for explorer Adam Johann Kruzenshtern. Length overall: 376 feet. Tonnage: 4,700. Sail area: 36,600 sq. feet. Capacity speed 17 knots. 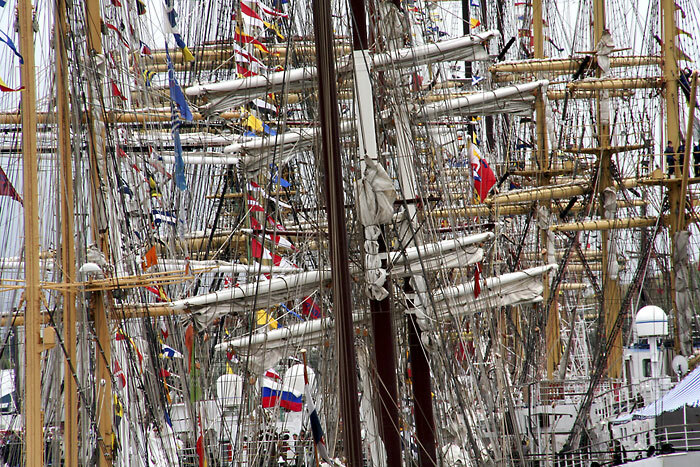 The Kruzenshtern is second only to the Sedov in size. 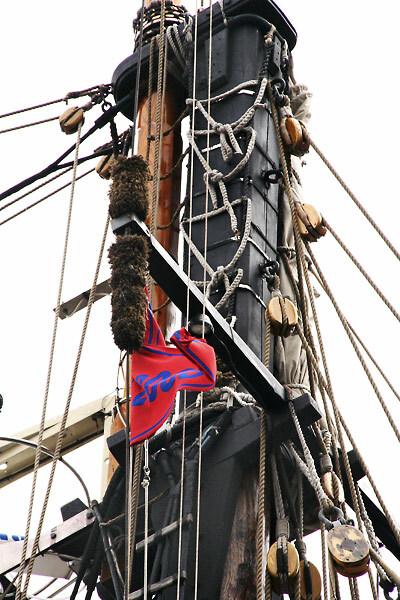 A ship's bell is sited at the base of the bowsprit. 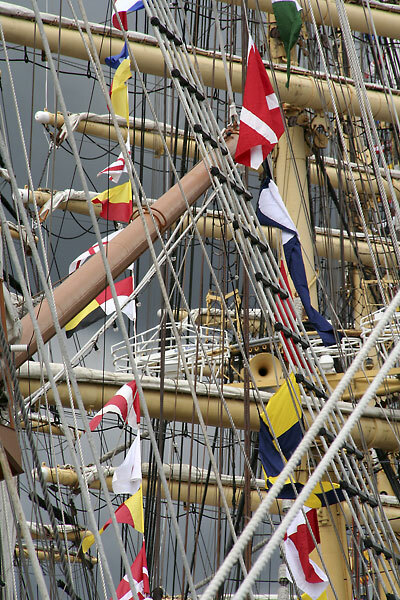 Rigged as a four-masted barque, the steel hull carries four steel masts, the tallest some 170 feet in height. 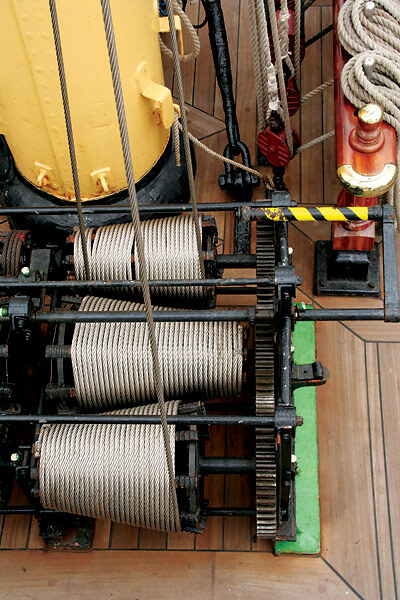 Here, rigging related bright steel cables are wound tautly on winch drums fitted to the main deck. 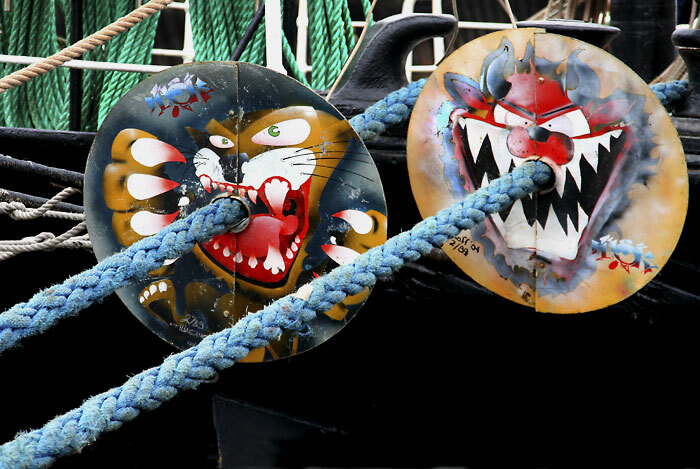 The bow mooring ropes carry discs to frustrate the entry of dockside rodents; the painted faces take them beyond the purely utilitarian. This iron-hulled vessel rigged as a topsail schooner was built as the Fredreich in Germany in 1911 for use in the hide trade with South America. 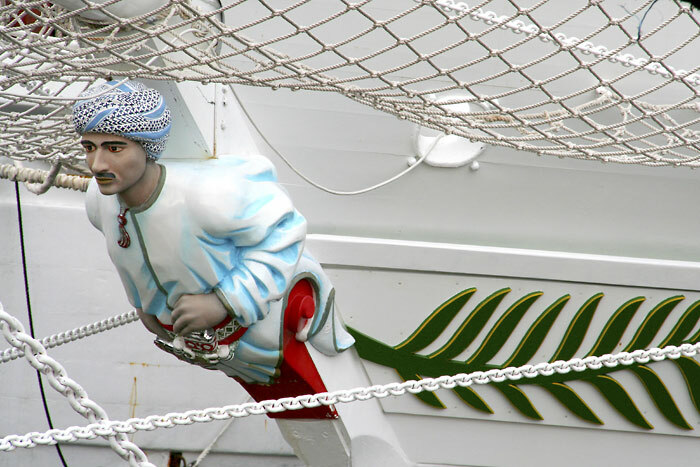 In 1923, she was bought by a Swedish company to carry mixed cargoes and was re-named Merry. 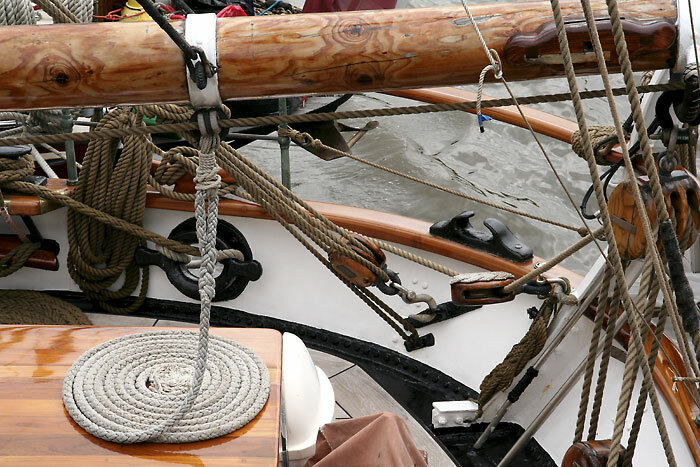 An engine was added in the 1920s and various rigging changes followed. After fire damage to the rear hull, she was rebuilt in Faversham, Kent, in the 1970s. 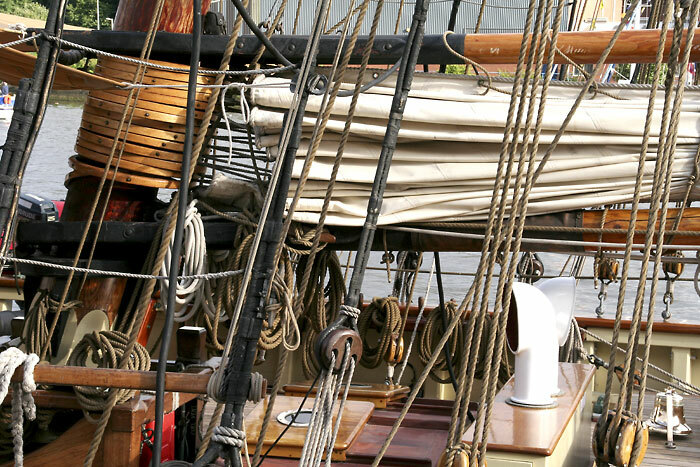 She now carries a unique brigantine rig, with square sails on the fore and on the upper mainmast above a fore-and-aft gaff and boom sail. 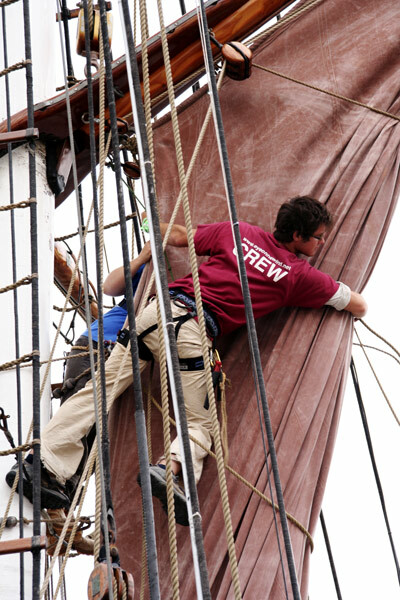 Here, crew furl sails after docking. Since her extensive restoration she has sailed worldwide and has been used in a number of films, including Blue Lagoon and Taipan. 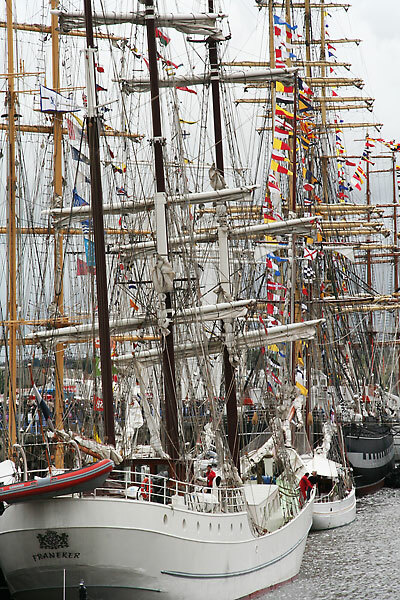 In this Tall Ships Race she had a young volunteer crew. 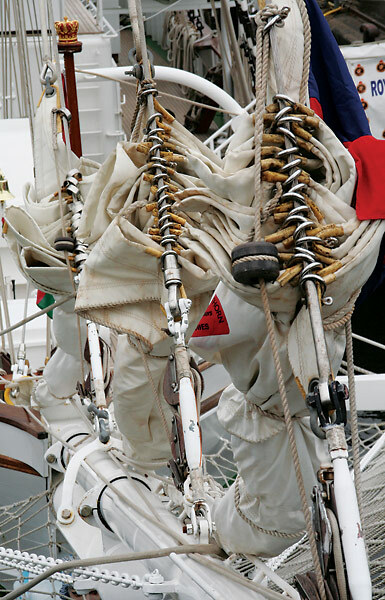 This image shows the furled sails on the bowsprit, its fittings and the safety netting below. The Eye of the Wind was in immaculate order as this stern shot shows. 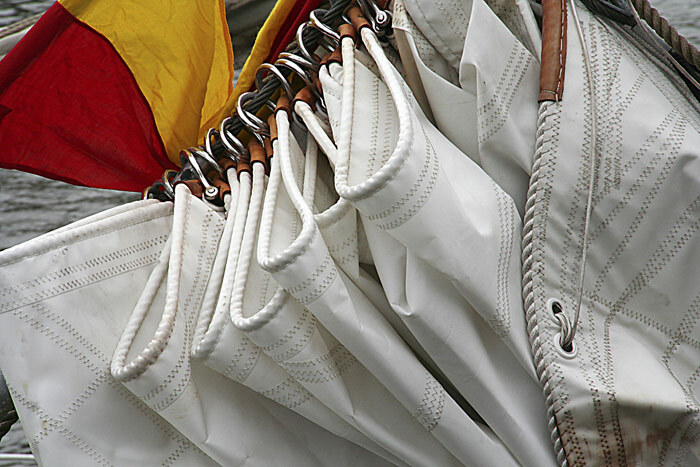 The final race leg to Scandinavia would prove hazardous for some of the ships in the severe North Sea weather after the fleet left the River Tyne. 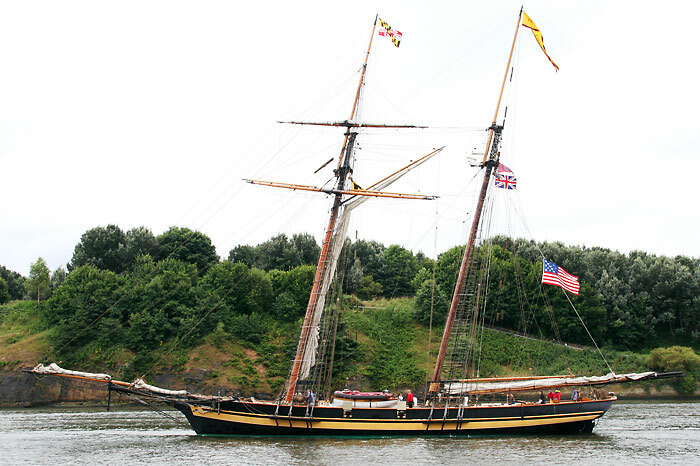 The Pride of Baltimore II is owned by the State of Maryland and was commissioned as a memorial replacement to its namesake predecessor of 1977, lost in a storm off Puerto Rico in 1986 with the captain and three of the crew of eleven. That ship was modelled closely on a topsail Baltimore Clipper c1812, and built using tools, materials and techniques of that era. At the time, 'Pride of Baltimore' was a popular name for the Chasseur, a topsail schooner captained by Thomas Boyle, a privateer who participated in the war between the United States and Great Britain between 1812 and 1815. This was caused partly by the British naval blockade of the eastern seaboard to disrupt trade with Napoleonic France. 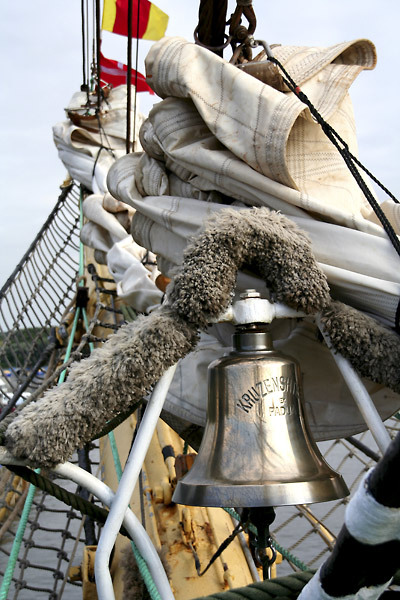 With an overall length of 157 feet, it displaces 188 tons, it carries 10,442 square feet of full sail, its mainmast tops 107 feet and it has a crew of twelve. Commissioned in 1988, its design interprets that of a Baltimore Clipper c1812 but it is built to contemporary construction and equipment standards. 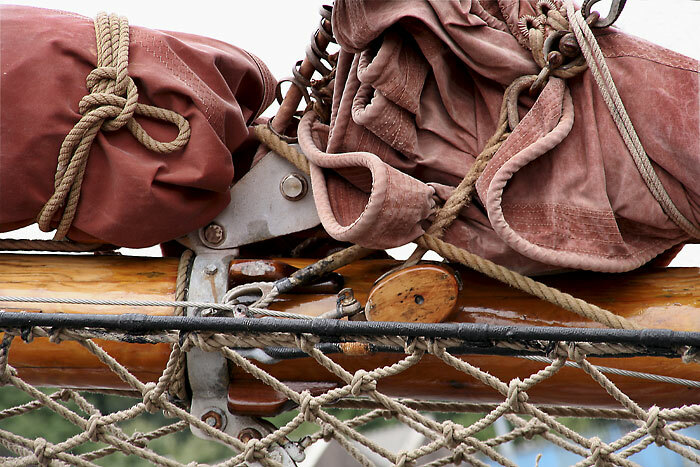 The rake of the masts, the long bowsprit and the low freeboard gives the vessel a distinctive style. 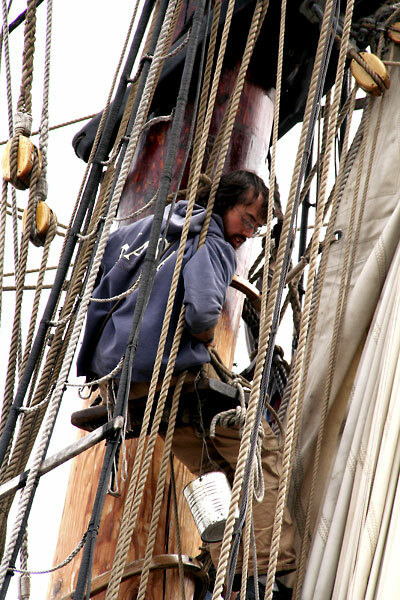 Like many of the other ships docked in Newcastle for those few days, the crew were occupied with running repairs and maintenance, such as stripping and re-varnishing the mainmast. 1909: Built as the Emanuel at Svendborg, Denmark. 1922: into Swedish ownership, was re-named Anna Lisa and equipped with an engine. 1927: wrecked. 1929: repaired as a gaff sail cargo schooner. 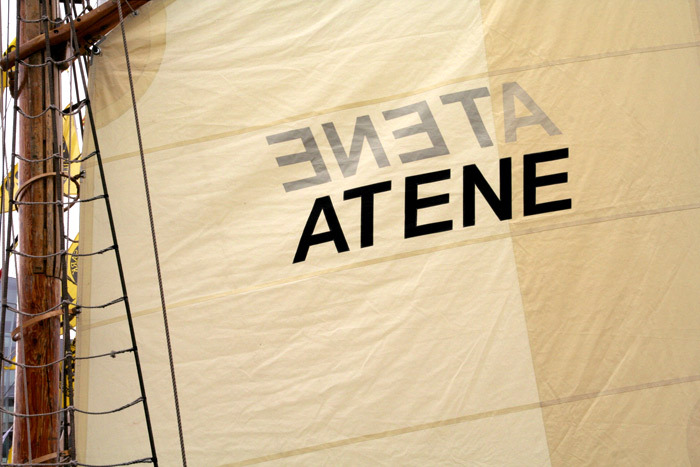 1965: became a yacht named Atene. 1980: bought by the m/s Atene Association as a school ship. LOA: 102 feet. Sail area: 2809 square feet. Launched at Buckie, Scotland, as the Captain Scott in 1971, where the builders used Scottish oak and Uruguayan pine as the principal structural materials. Rigged as a topsail schooner, the ship was used by the Dulverton Trust for youth sail training allied to land expeditions. Sold to Oman in 1977, she was renamed Shabab Oman (Youth of Oman) and joined the Royal Navy of Oman in 1979 as a youth sail training ship. A 1984 refit saw the ship re-rigged as a barquentine, with lower masts in aluminium and upper masts and spars in rattan plywood.